James Dewey Calhoun was born about 1904 near Ray City, GA. His grave marker in Beaver Dam Cemetery, Ray City, GA gives his birth date as June 22, 1904, but his Social Security records listed his date of birth as June 22, 1901. 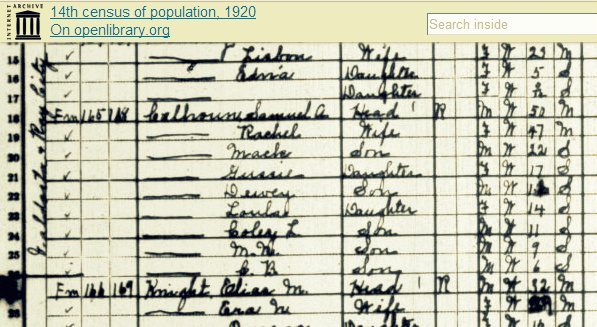 Census records place his date of birth variously at about 1902, 1904, or 1907. Based on the research of family members, the 1901 date is probably the most accurate. He was a son of Samuel Augustus Calhoun and Rachel Bullard, and a brother of Joseph Burton Calhoun. The image detail below, of James Dewey Calhoun and his father, is believed to date from around 1907. 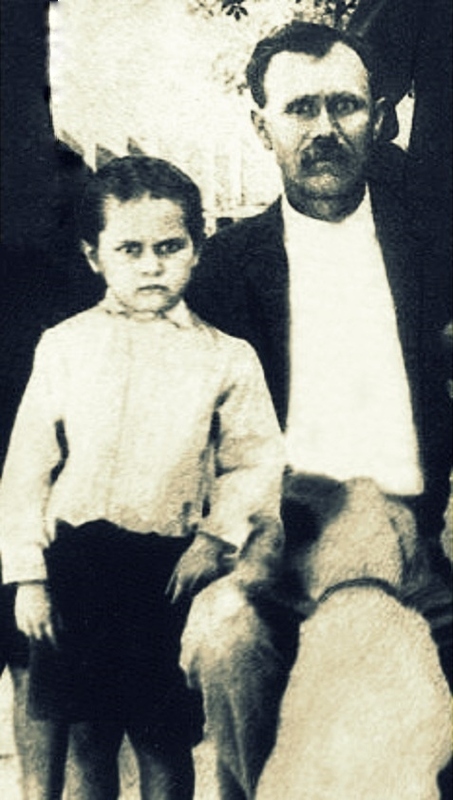 James Dewey Calhoun as a young boy with his father, Samuel Augustus “Gus” Calhoun. Image detail courtesy of Mitchell Calhoun. 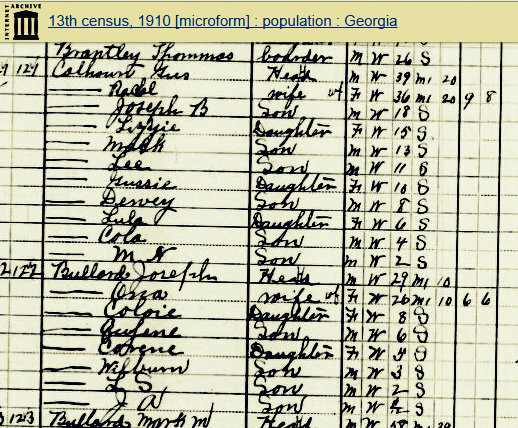 James Dewey Calhoun first appears in the census records in 1910, enumerated as “Dewey.” He was one of nine children in his parent’s household at Ray City, GA. Samuel’s mother was Rachel Bullard Calhoun, a daughter of Luvellia Ray and Mack Bullard. In the 1920s the Calhouns were living at Ray City, GA where Dewey’s father rented a place on the Valdosta & Ray City Road. Dewey had a common school education, but by age 12 he was working on the Calhoun farm assisting his father with farm labor along with his brothers. Just around the corner from the Calhoun place was the farm of Elias M. “Hun” Knight, businessman of Ray City and owner of the Mayhaw Lake Resort. 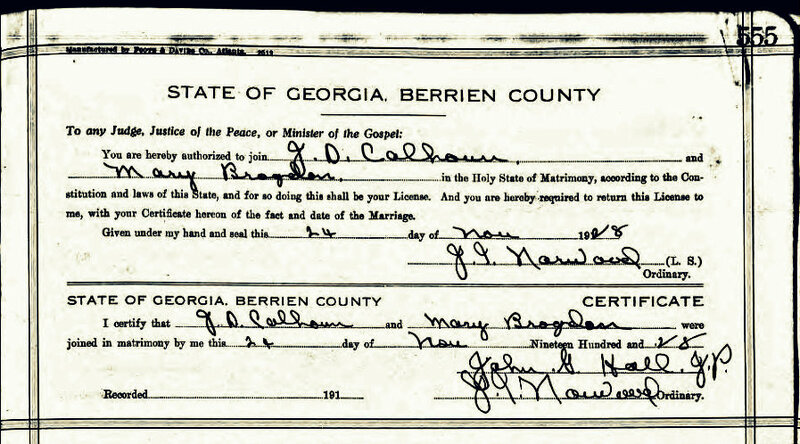 James Dewey Calhoun married Mary Elizabeth Brogdon on Saturday, November 24, 1928 in Berrien County, GA. The ceremony was performed by John G. Hall, Justice of the Peace. Dewey was 21 and Mary was 18 at the time of their marriage. She was a daughter of Thomas Brogdon and Blancett Swilley. Like Dewey, she had a common school education through 7th grade. After marriage Dewey and Mary Calhoun made their home in the Lois precinct of the 1329 Georgia Militia District (Connell’s Mill District), where they began raising crops and children. Dewey rented a farm next door to the 260 acre farm of Minerva Futch and John L. Allen. The Allen place (formerly the farm of Jehu Patten) was on land Lot 454 of the 10th land district (see map), located just southwest of Ray City, near the farms of Francis Marion Shaw, Lacy Shaw, and Jesse Shelby Shaw (see http://www.audubon4tet.com/FMS/21_John_Levi_Allen.pdf). Lon Fender, one of the big timber men and turpentine operators of the Wiregrass, was also renting a farm nearby. 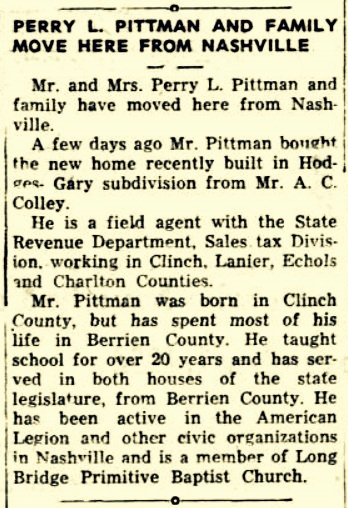 The census taker who visited the Calhoun family to take their enumeration in 1930 was Perry Lee Pittman. By the 1940s Dewey and Mary had moved their family to Alapha, GA where they rented a home on “Nashville and Nashville” road for $5.00 a month. The employment data from the 1940 census shows Dewey was working 24 hours a week for the WPA while Mary kept home and the children attended school. In late 1938 the Work Projects Administration (WPA) began construction of a gymnasium for the public school in Alapaha, GA.
Other Work Projects Administration (WPA) projects in Berrien county include an annex added to the west side of the Berrien County Courthouse in 1938. In 1940, WPA workers assisted with the construction of the lunchroom at the Ray City School. Bill Outlaw described a WPA project digging a ditch in Buck Bay, then called Beaver Dam Bay, on the W.H. Outlaw farm previously known as the Jerry S. “Buck” Sutton Old Home place (See Bill Outlaw’s Georgia Centennial Farm application for the W. H. Outlaw farm for interesting commentary on Berrien County farm life over the last 150 years). WPA instructors were also involved with the Civilian Conservation Corps (CCC) camp at Homerville, GA where Ray City and Berrien County men were working. Later the Calhouns were back at Nashville, GA. Census data beyond 1940 has not yet been released, but school photos from the 1950s show Mary and Dewey Calhoun’s children continued to attend at the Nashville public schools. 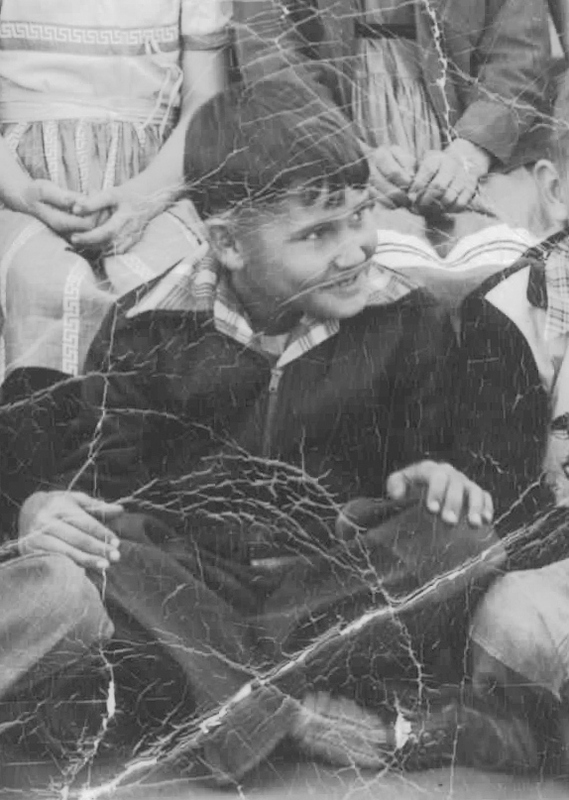 Class photos from 1954 show Densil Calhoun was attending school at Nashville Elementary. Densil Calhoun, son of Dewey Calhoun, 4th grade school photo, 1954, Nashville Elementary School. The 1972 obituary of Joe B. Calhoun mentions that his brother, Dewey Calhoun was still residing in Nashville, GA.
James Dewey Calhoun died November 3, 1980. He was buried at Beaver Dam Cemetery, Ray City, GA. His widow, Mary Brogdon Calhoun, continued to reside at Nashville, GA but was a member of the Baptist Church in Ray City. Mary died in 2002 and was buried next to her husband at Beaver Dam Cemetery. NASHVILLE — Mary Calhoun, 96, of Nashville, died May 5, 2002, in the Memorial Convalescent Center of Adel. Born on Aug. 26, 1905, to the late Thomas Brogdon and Blancett Swilley, she was a homemaker and member of First Baptist Church of Ray City. She was preceded in death by her husband, Dewey Calhoun, who died in 1980, and two sons, Howard and Rex Calhoun. Survivors include one daughter, Martha Gurganious of Nashville; two sons, Densol Calhoun of Nashville and J. D. Calhoun of Jackson; 11 grandchildren; 12 great-grandchildren; and two great-great-grandchildren. Funeral services are scheduled for 11 a.m. Tuesday, May 7, 2002, in the chapel of Lovein Funeral Home with the Rev. Clarence Luke and the Rev. Fred Hesters officiating. Burial will follow in Beaver Dam Cemetery. Visitation is today after 4 p.m. with the family receiving friends from 7 p.m. to 9 p.m. — Lovein Funeral Home. 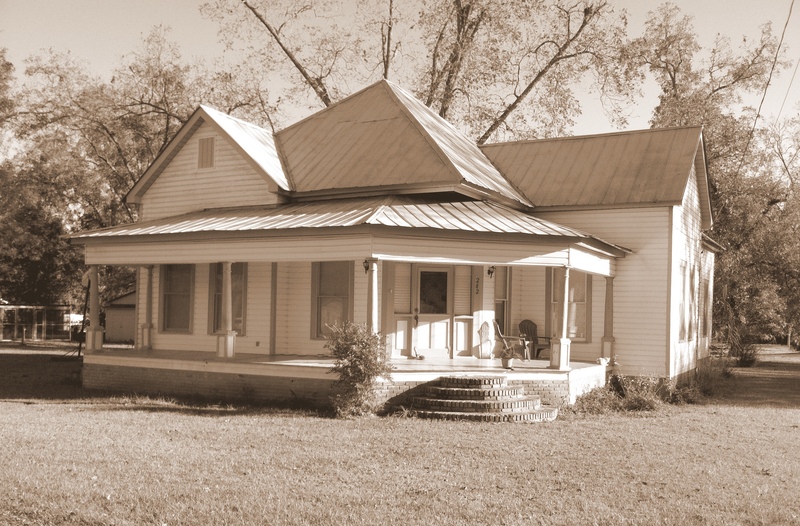 Perry L. Pittman and family rented this Ray City, GA home in the 1930s and 1940s. Perry L. Pitman was a son of Louranie W. “Rainey” Register and John Edward Pittman. He was born December 3, 1898 in Clinch County, GA and lived for many years in Berrien County, GA. As a young man, Pittman was of medium height and medium build, with blue eyes and black hair. He first married Annie Jewel Fountain, on July 27, 1921 in Berrien County, GA. She was daughter of William E. Fountain and Nancy Elizabeth Bradford. After Annie’s death on July 17, 1934, Perry L. Pittman raised their children on his own of several years. On November 27, 1935 Pittman married Vida Inez Williams, the widow of Fred Williams. She was born August 9, 1903, a daughter of James Alford Webb and Pearlie Ann Register. For a time, in the late 1930s and 1940s Perry and Inez Pittman made their home in Ray City, GA. Perry was a patrolman for the highway department, working 60 hours a week for an annual salary of $1200 dollars. 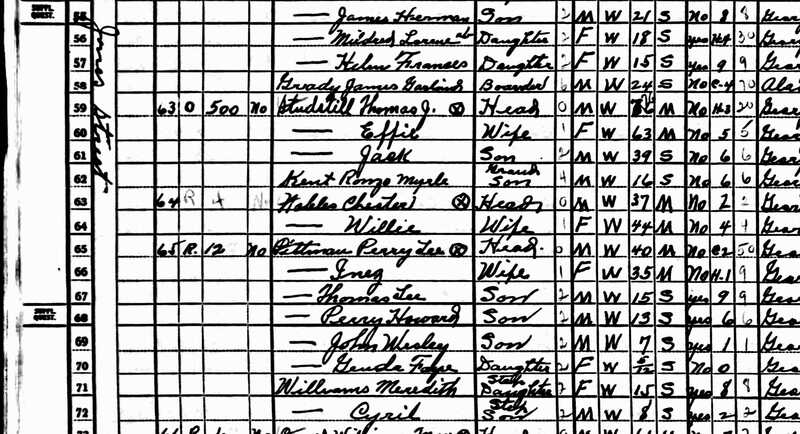 1940 census enumeration of Perry Lee Pitman and family in Ray City, GA.
During this time Perry Lee Pittman also served as the State Representative from Berrien County, GA. In the state legislature he became noted for his opposition to the Grandfather Clause, the Georgia Constitutional Amendment that violated the voting rights of African-Americans in Georgia. He was also noted for his opposition to religious ceremonies involving the practice of handling live rattlesnakes. Perry L. Pittman Opposed Disenfranchisement of Georgia’s Black Voters. In 1940s Perry Lee Pittman was a patrolman for the State Highway Department. He was renting a house on Jones Street, Ray City, GA where he lived with his wife, Inez, and their minor children: Howard Pittman, Tommy Pittman, Johnny Pittman, Meredith Williams, and Cyril Williams. He was a son of Louranie W. “Rainey” Register and John Edward Pittman. He was born in Clinch County, GA and lived for many years in Berrien County, GA.
Perry L. Pittman served as the State Representative from Berrien County, GA, and was noted for his opposition to the Georgia Constitutional Amendment that violated the voting rights of African-Americans in Georgia. Perry L. Pittman was dedicated in service to his country and community. He was a Ray City veteran of World War I, a teacher, law enforcement officer, and state legislator. 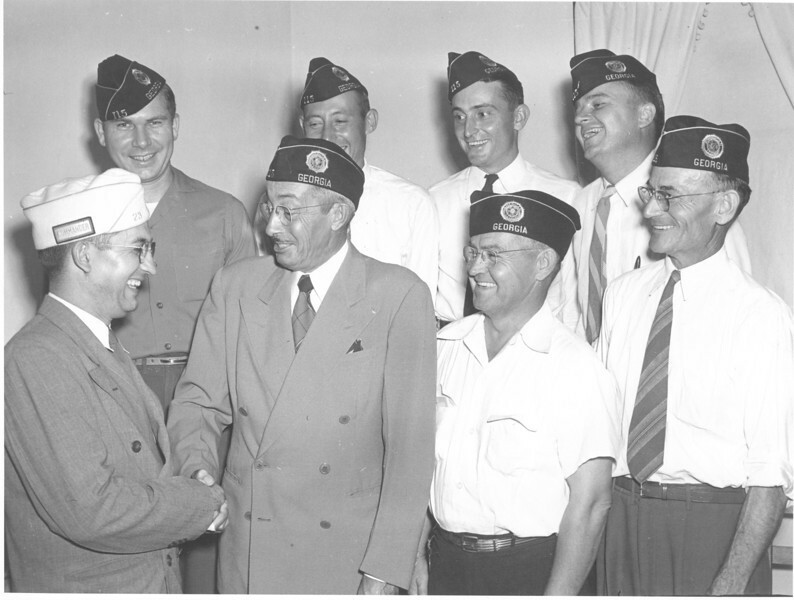 He was active in the American Legion and other civic organizations, and a member of the Primitive Baptist faith. Perry L. Pittman, the State Representative from Ray City, GA.
Representative P. L. Pittman of Berrien. A representative for a decade, Perry L. Pittman now knows just what makes the wheels behind the law-making body of Georgia turn. He’s a teacher and a farmer and for 18 years has taught in the rural section. A World War veteran who is most interested in education and agriculture, he is staunchly opposed to the grandfather clause. He believes in economy and hopes to curtail expenditures whereby all past obligations may be paid in full and old people may receive their benefits through pensions. He thinks pensions should be equally divided among the blind, cripple, and the dependent. The solon is 42, married, the father of four daughters and one son. In 1906, Hoke Smith campaigned for governor on a progressive platform — but one that championed disfranchisement of Georgia’s black voters. To accomplish this, Smith supported a constitutional amendment that provided that any male at least 21 years of age wanting to register to vote must also: (a) be of good character and able to pass a test on citizenship, (b) be able to read and write provisions of the U.S. or Georgia constitutions, or (c) own at least 40 acres of land or $500 in property. However, any Georgian who had fought in any war from the American Revolution through the Spanish-American War was exempted from these additional qualifications. More importantly, any Georgian descended from a veteran of any of these war also was exempted. Because by 1908, most white Georgia males were grandsons of Confederate veterans, this exemption became known as the “grandfather clause.” Essentially, the qualifications of good character, citizenship knowledge, literacy, and property ownership applied only to blacks wanting to register to vote. Georgia’s Grandfather clause remained in effect until it was struck down by the federal Voting Rights Act of 1965. From Ray City, the Pittmans moved to Nashville, GA. Later they would live in Homerville, GA and Valdosta, GA.
Mr. and Mrs. Perry L. Pittman and family have moved here [Homerville, GA] from Nashville. A few days ago Mr. Pittman bought the new home recently build in Hodges Gary subdivision from Mr. A. C. Colley. He is a field agent with the State Revenue Department, Sales tax Division working in Clinch, Lanier, Echols and Charlton Counties. Mr. Pittman was born in Clinch County, but has spent most of his life in Berrien County. He taught school for over 20 years and has served in both houses of the state legislature, from Berrien County. 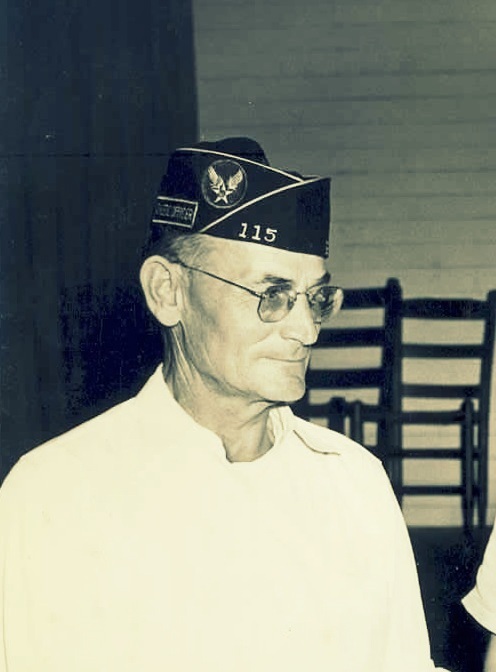 He has been active in the American Legion and other civic organizations in Nashville and is a member of Long Bridge Primitive Baptist Church. In these Valdosta Daily Times personal mentions from the spring of 1922, the Ray City news items were mostly about the social activities of the young people of the community. An interesting note is the mention of the Ray City Band and the musical troupe’s excursion to Valdosta, GA.
Ray City, Ga., April 5. –Miss Eula Lee Connell and Miss Lilla Gaskins, accompanied by Miss Connell’s parents, spent Sunday with Mr. and Mrs. O. B. Connell, of Valdosta. Miss Gola Tom Gaskins was the guest of Miss Gola Flem Gaskins Saturday night and Sunday. They were accompanied by Mr. Harvey Clements Sunday afternoon for an afternoon ride. Mr. Fred Williams was the company of Miss Inez Webb Sunday afternoon. Miss Eula Walden spent Sunday with Miss Mae Bowden. The Ray City band went to Valdosta Sunday afternoon for a concert with them. Mis Beulah Lee spent the weekend with Miss Jennie Watson. Miss Gola Tom Gaskins will be the guest of Miss Eula Lee Connell during the week-end of Easter. Mr. Grover Combs was a visitor to Miss Minnie Gaskins Saturday afternoon. Miss Mary Shaw and Miss Julia McClelland spent Saturday night and Sunday with Miss Mona Strickland. Mr. Albert Bradford was a visitor to Miss Rachel Wetherington last Saturday night. Mr. Adrian Williams was the visitor of Miss Ethelyn Terry Sunday night. Eighteen year-old Lilla Gaskins, was a daughter of Daniel Jackson Gaskins and Sarah Elizabeth “Lizzie” Gray. The Gaskins made their home on Cat Creek Road in the Lois community. Lilla’s friend and neighbor, Eula Lee Connell, age 14, was a daughter of Clinton D Connell and Reedy M Connell. That week, Lilla travelled with the Connells to visit their relatives, Mamie and Oscar B. Connell, in Valdosta, GA. Later, Lilla Gaskins would serve as the Berrien County Clerk of the Superior Court. Another neighbor and cousin was sixteen year old Golie Gaskins, daughter of Mary E. and Flemming B. Gaskins. She was was visiting with another cousin of the same name and age who was the daughter of Linie and William Thomas Gaskins. Their companion was Harvey J. Clements, son of Henry Clements of Ray City. Vida Inez Webb, of Ray City, was a daughter of James Alford Webb and Pearlie Ann Register. In 1922, she was being courted by Fred S. Williams of Cat Creek. They were married the following year. Later, Vida Inez Webb married Perry Lee Pittman. Mae Bowden was a daughter of Ressa and Hayne Bowden. The Bowdens had a home on Main Street in Ray City, where her father was a barber. Beulah Lee was the 18 year old daughter of Wealthy Mathis and John A. Lee. They lived at Ray City on the Willacoochee Road, on the farm of Beulah’s brother, Robert E. Lee. She spent the last weekend of March, 1922 with her friend Jennie Watson. This may have been 18-year-old Jentis Watson, daughter of Samuel I. Watson who had a place on the Ray City & Mud Creek Road. Miss Minnie Gaskins, another daughter of Daniel J. Gaskins and sister to Lilla Gaskins, was called upon by Grover Cleveland Combs, who would later own a restaurant in Valdosta. Mona Strickland, 16 year-old daughter of John and Onnie Strickland of the Lois community near Ray City, entertained guests Julia McClelland, of Adel, and Mary Vera Shaw, of Ray City. Rachel Wetherington was the 15-year-old daughter of Bell and Linton A Wetherington, of Cat Creek. Her visitor was Albert Bradford, a 19-year-old Gaskins cousin, son of the widow Maggie Gaskins Bradford, of Lois. His father, Mack Tally Bradford, died in 1919. Ethelyn Terry was the 16-year-old daughter of Mary V. and Jack Terry. Her father had a farm on the Valdosta Road at Ray City, near the places of John W. Cowart, Mallie Shaw and Lewis W. Register. Ethelyn’s caller was Herman Adrian Williams of Cat Creek. 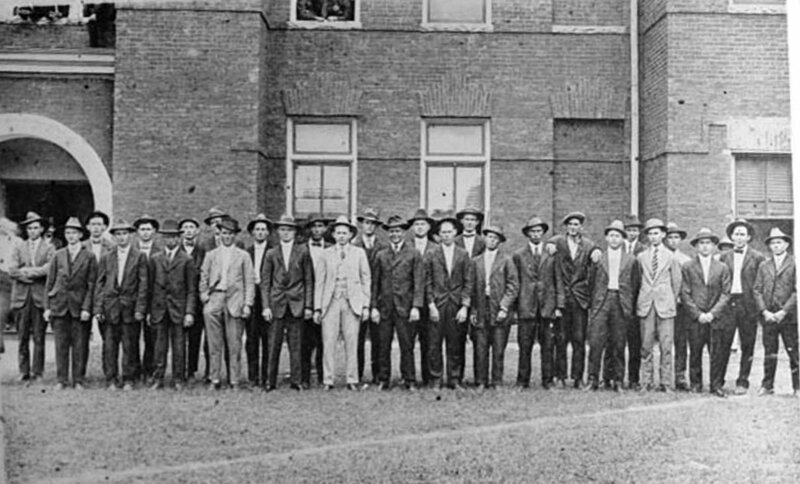 The men of Ray City, Berrien County, Georgia served in World War I. Some served with honor, a few found difficulty, still others gave their lives (see Otranto Disaster.) Below is a partial list of Ray City Veterans who returned from service in World War I, with links to details of their service records. WWI Berrien county Inductees at Nashville, GA Courthouse, 1918. 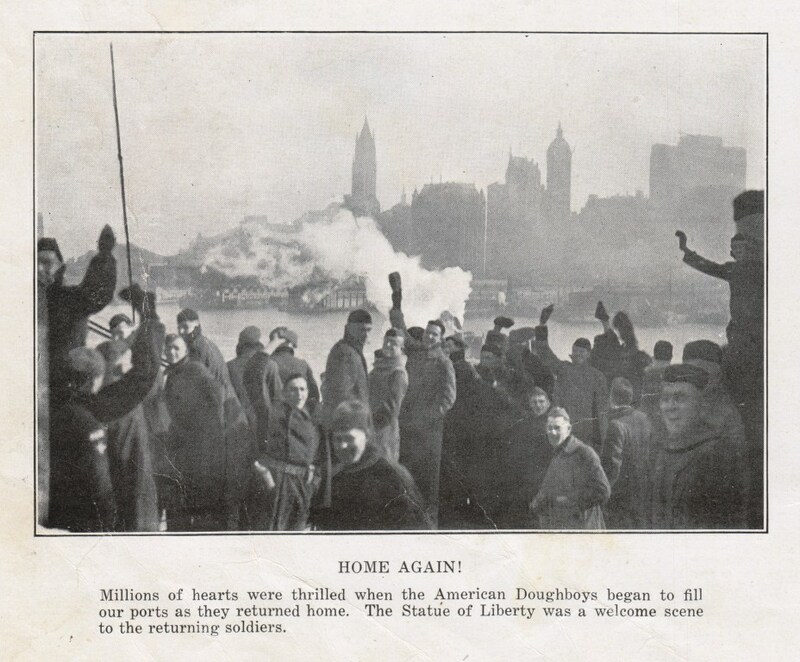 World War I soldiers returning home.